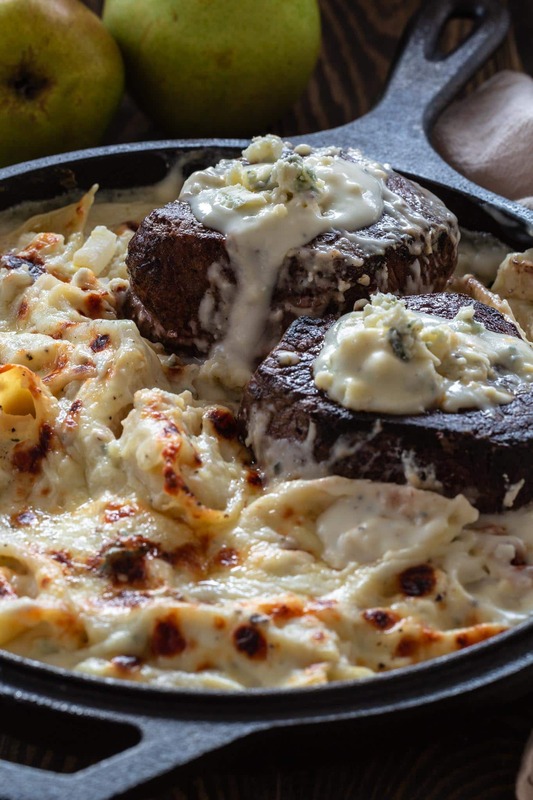 Succulent pan seared filet mignon steaks, served with a Pear and Ricotta Conchiglioni Gratin and topped with luscious Gorgonzola sauce. I can’t think of a better way to treat your Valentine! I hope you are ready for all the deliciousness coming your way these next few days! I’ll be sharing recipes you can cook for two, so you can impress your loved ones. Think gourmet dinners, decadent desserts and even delightful cookie treats. Oh, we are going to have a blast! And we are starting with a bang with this pan seared filet mignon showstopper. I’m drooling just by remembering how good this was! I grew up eating filet mignon on a regular basis, as it is not so expensive down in Brazil. Here in the US it can get pricey, so we don’t always splurge for it, except on special occasions. Well, Valentine’s Day is the perfect excuse! Cooking a delicious and romantic meal at home, instead of braving the lines at overpriced restaurants, calls for a little splurging at the grocery store, don’t you agree? Besides, no other cut of meat shines as much as this one under the candlelights! 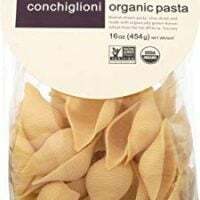 Ultra tender and mild in flavor (compared with more robust steaks, like the ribeye), it goes great with delicate and elegant side dishes, like the Conchiglioni Gratin. So get the candles, fancy china and wine ready. It will sure be an evening to remember! 2 filet mignon steaks (about 10 – 12 ounces each). Ricotta, pear and heavy cream for the filling. Gorgonzola, butter, flour and milk for the sauce. Parmesan to top the gratin. In spite of the fanciness of the cut of meat and the name of some of the ingredients, this elegant dinner doesn’t require a lot and is quite easy to put together! Conchiglioni are large Conchiglie pasta, sometimes known here in the US as “pasta shells” because of their shape. They are typical from southern Italy, originating in Campania. They are sold dried, usually made from plain durum wheat, but you can sometimes find them colored or whole wheat. Conchiglioni are perfect for stuffing and baking, since they hold up well during cooking. The ridged exterior also means that the sauce will cling to them beautifully, making every forkful an explosion of flavors! It shouldn’t be hard to find them at your supermarket, even if just labeled as “jumbo shells”. However, if you can’t find them, you can use Lumaconi or Canneloni instead. It is not new information that pears and cheese go great together! But you might not have tried them in pasta form. And if that’s the case, be prepared to have your socks knocked off your feet! The tender and sweet pears pair so well with the ricotta’s creaminess and the sharp funkiness from the gorgonzola, making this one of my favorite fillings for stuffed pasta dishes. There are few things that are as disappointing as soggy baked pasta. You see that beautiful, cheesy casserole coming out of the oven and when you go dig in, it is mush! 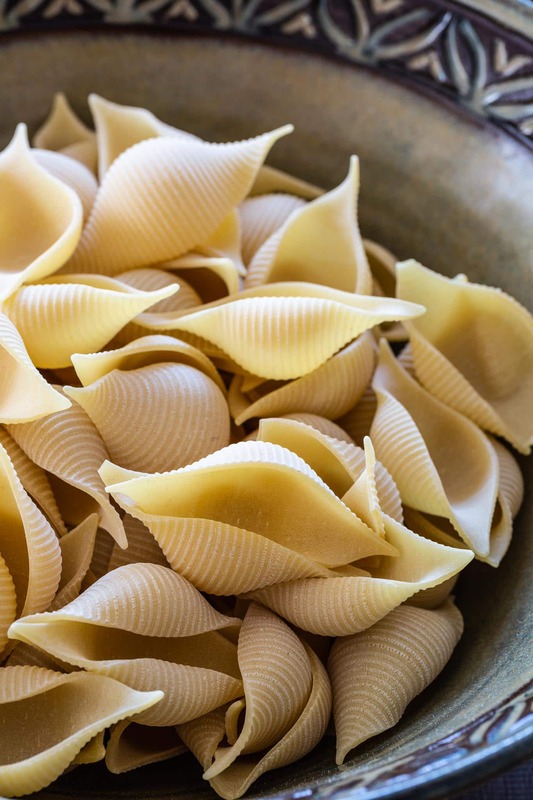 To avoid that, you have to not only choose the right kind of pasta for the job – and, as I mentioned, conchiglioni are great for baking – but also undercook the pasta. Yes, the conchiglioni needs to be precooked but you have to be extra careful to not cook it all the way through, as it will continue cooking when it goes in the oven. I also recommend popping the gratin under the broiler for a few minutes after it is ready, for that golden, bubbly crust that we all love! Now that we talked all things pasta gratin, we need to address the big star here: the filet mignon. After all, you can have the best side dish ever but if your steaks are not cooked to perfection, then it will all be for nothing! Buy good quality meat from a trusted source. If you don’t have one already, I recommend finding a great butcher in your area and developing a relationship with him or her. 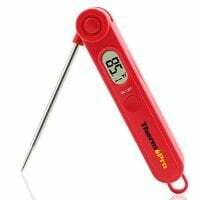 Invest in a meat thermometer! I feel like a broken record, as I say that whenever I write about meat. But it really is a game changer and takes the guessing out of the equation. Besides, they are pretty affordable these days! Choose the right pan. My favorite way to cook steaks on the stove is to use a cast iron pan. It facilitates the very high temperatures that you will need for that beautiful sear and heats evenly, guaranteeing that both steaks will be done at the same time! Also, make sure the pan is smoking hot before adding the steaks, so they sear right away, keeping the juices inside the meat. For a crusty sear, pat the steaks dry with paper towels before searing. Don’t be afraid of salt! Season generously, as there is nothing worse than bland steaks. Don’t overcook the steaks. Unless you are a well done meat lover, your steaks shouldn’t go past 145 degrees F. I actually recommend you remove them from the pan at around 135 if you want them cooked medium, as they will continue cooking as they rest. That being said, I should disclose that the USDA recommends steaks to be cooked to 145°F (medium). Always rest your steaks! After they are done searing, remove the steaks to a cutting board and tent with foil. Rest for at least 5 minutes before cutting them, to give the internal fibers a chance to relax and for the meat to reabsorb all of its juices. Your pan seared filet mignon steaks are perfectly cooked and the pasta gratin is just out of the oven, looking cheesy, bubbly and superb! 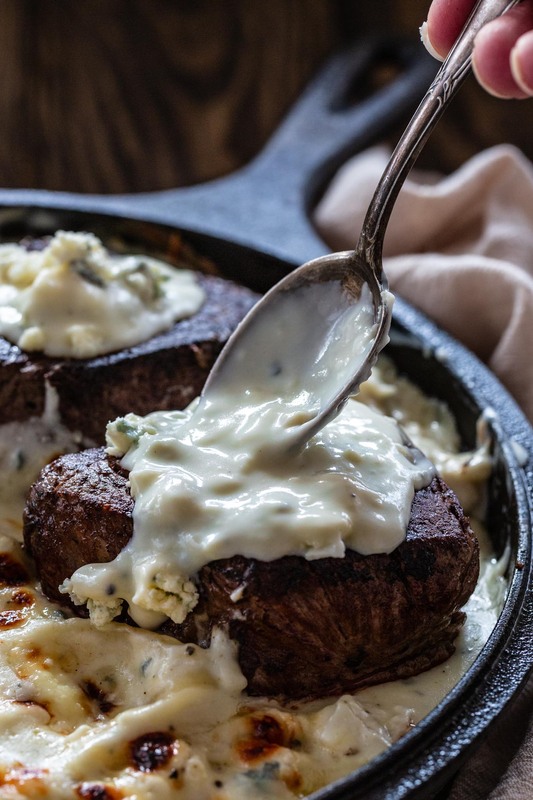 All you gotta do is spoon some of that creamy gorgonzola sauce on the steaks, garnish with some crumbled gorgonzola for that restaurant look and take that masterpiece to the table. And now you are all set for a great evening with your special someone. Oh, and don’t worry! We’ll talk dessert later this week. 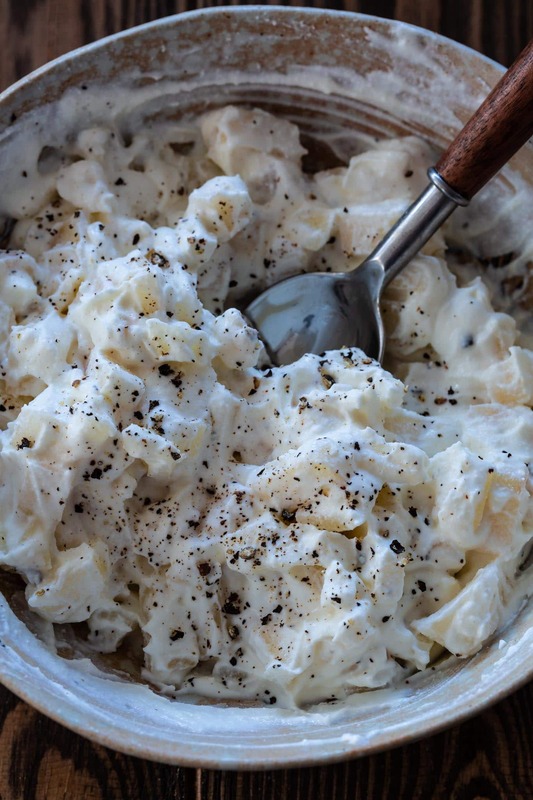 In a medium bowl, combine the ricotta, diced pear and heavy cream. Season with salt and pepper. Reserve. In a large pot with boiling salted water, cook the conchiglioni shells until they are not yet al dente, about 2 - 3 minutes less than what the package suggests. When done, drain and run under cold water to stop cooking. 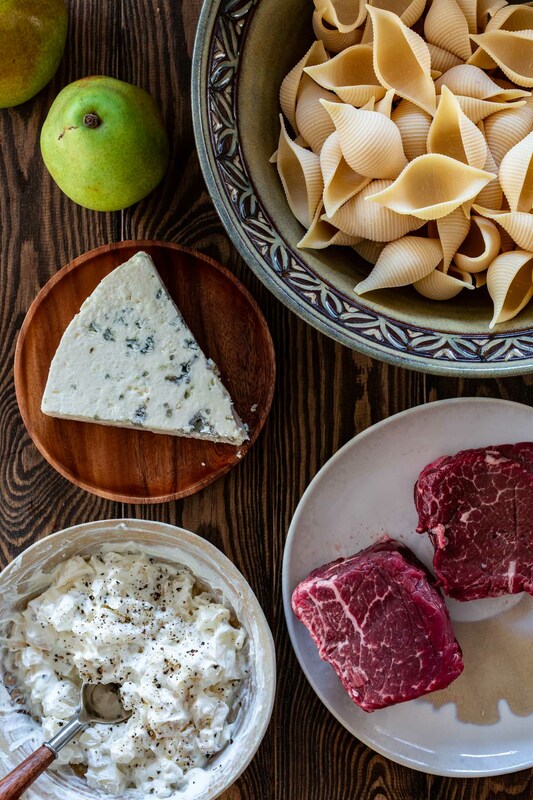 Make the gorgonzola sauce. In a saucepan, heat the butter, over medium low heat, until melted. Whisk in the flour and cook for a minute or so, to get rid of that raw flour smell. Slowly add the milk, whisking constantly, and cook until the sauce begins to thicken. Add the crumble gorgonzola and stir until the cheese melts and the sauce reaches desired consistency. It should be creamy but not too thick and spoonable. Season with salt and pepper. Stuff shells with the ricotta pear mixture. 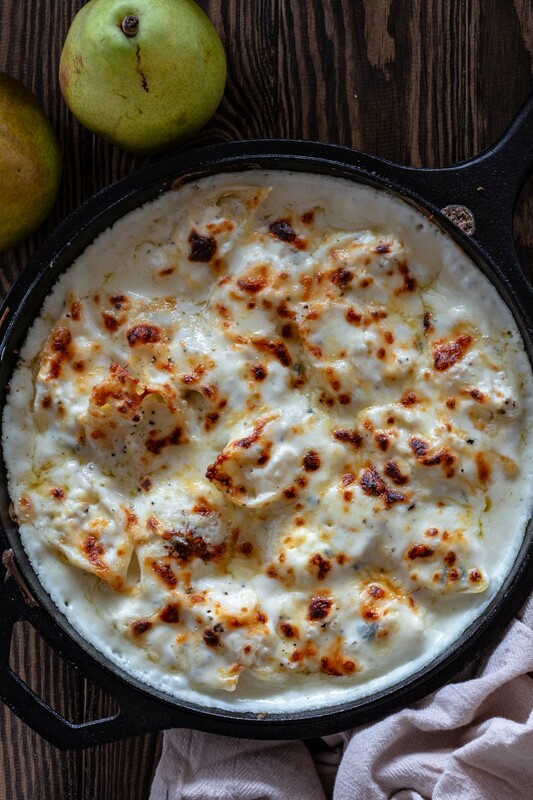 Add a layer of gorgonzola sauce to a medium sized baking dish or cast iron. Arrange the stuffed conchiglioni on top and pour the remaining sauce on top, reserving some to spoon on the steaks. Sprinkle the parmesan cheese and bake in the preheated oven for 10 to 15 minutes or until the pasta is al dente. Optional: pop it under the broiler for 2 - 3 minutes or until golden and bubbly. When the gratin is ready, remove from oven and let it rest for at least 5 minutes. While the gratin is baking, cook the steaks. Season the filet mignon steaks generously with salt and pepper. 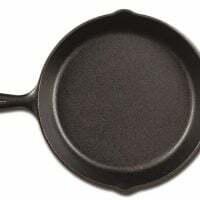 Heat the vegetable oil in a cast iron or skillet, over medium high heat, until smoking. Add the steaks and sear for 2 to 3 minutes per side. 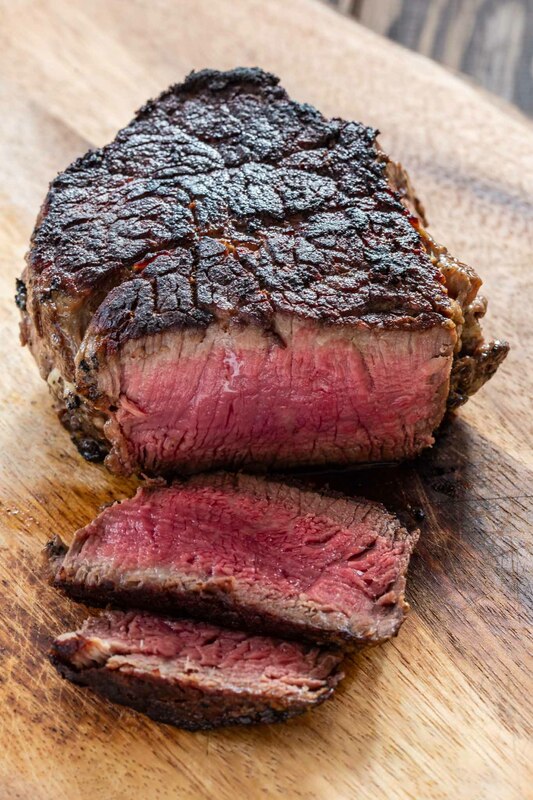 Remove from pan to a cutting board when a thermometer reads 135 degrees F. Cover with foil and let the steaks rest for at least 5 minutes before serving. Serve the steaks with the conchiglioni gratin, topped with the remaining gorgonzola sauce.